Sword ﬁshing, high speed trolling, paddle boarding, cruises with Pokemon gamers in mind, and island trips just to cover a few. We will customize your own unique water experience, just ask! Advanced angler? Beginner? Float with us to catch ﬁsh or simply enjoy the scenery. Allow us to create amazing memories, superb ﬁsh catching and a fantastic time. There is nothing like a day filled with a fishing adventure off the coast of beautiful South Florida. A fishing experience in crystal clear waters just a few miles from the coast will enable you to breathe in the fresh air and completely relax yourself in the company of your family, friends or colleagues. Every fishing experience with Goddess Charters includes all the necessary equipment and fishing licenses. 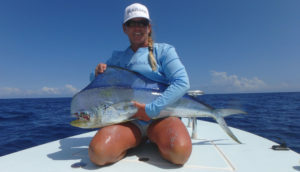 Our team has been fishing and boating in South Florida for over two decades. We are ready to make your deep sea fishing experience the best adventure of your life. My love for fishing and the outdoors started at a young age. Beginning with ICW fishing, pier fishing, then boats. Becoming one of the top fisherman in the world was a special goal of mine. From light tackle to heavy tackle fishing, I wanted to master it all. For the past 32 years, I have done just that. I want to bring the adventure and excitement to you, something that has always put a smile on my face! Watching anglers, families and friends when they catch the fish of a lifetime allows 32 years of hard work to pay off. I’m a native “Delrayite”, and my love for the water came at an early age when sand fleas were plentiful and crabs still walked across A1A. Being a part of a founding family of Delray Beach made it easy since the ocean was within walking distance. I’m certified as an ARC Lifeguard Instructor, Water Safety Instructor, AED, O2 and PADI diver navigated my path through ocean life. My love went towards teaching swim lessons, surfing, paddle boarding and kayaking. In addition to my knowledge about diving, knowing the beaches and topographical features associated with the surrounding waters, the outdoors and ocean has been an irreplaceable guide and friend my whole life. Between both of us, our years of experience, our combined passion for life, we’ll prove the best time of your life is aboard the 34’ custom boat “Grim’s Revenge”. Grims Revenge is a custom 34′ Michal Fitz charter boat docked at the prestigious Marina One in Deerfield Beach Florida. 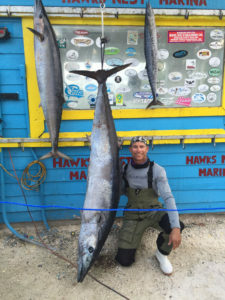 Captain Cory Burlew is the owner and he has over 25+ years of fishing experience all over the world. 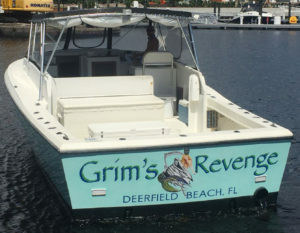 Captain Cory has customized the Grims Revenge to have all featured needed to have a hands on fishing charter trip anywhere in South Florida or the Bahamas. Get Ready to Catch Fish and Have Fun!